This image shows the electrical response of a circular diaphragm composed of a pure bottlebrush elastomer upon electroactuation with increasing voltage and without any external pre-strain. The numbers indicate the electric field-induced area expansion under constant-volume conditions at room temperature. Image: Richard Spontak. 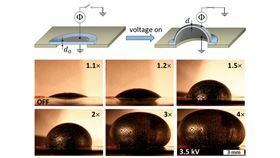 A multi-institutional research team has developed a new electroactive polymer material that can change shape and size when exposed to a relatively small electric field. With this advance, the team has managed to overcome two longstanding challenges in using electroactive polymers to develop new devices, opening the door to a suite of applications ranging from microrobotics to designer haptic, optic, microfluidic and wearable technologies. The work was performed by researchers at North Carolina State University, the University of North Carolina at Chapel Hill (UNC), Carnegie Mellon University and the University of Akron, and is reported in a paper in Advanced Materials. "Dielectric elastomers are the most responsive electroactive polymers in terms of achievable strains, but two big hurdles have effectively prevented the smart materials community from using them in commercial devices," says Richard Spontak, professor of chemical and biomolecular engineering and materials science and engineering at NC State, and one of the authors of the paper. "First, previous dielectric elastomers required large electric fields in order to trigger actuation, or movement – on the order of at least 100 kilovolts per millimeter (kV/mm). With our new material, we can see actuation at levels as low as ca. 10kV/mm. "The second challenge is that, previously, materials had to be pre-strained. This would either mean using a frame to physically strain the material, or adding a second component to the polymer to retain the strain after it was applied. But our material consists of a single component that is specifically designed at the molecular level to inherently possess pre-strain. In other words, we don't need a frame or a second component – our material is ready to be used as soon as it is cross-linked into a specific shape." The new material that has permitted this breakthrough is a ‘bottlebrush’ silicone elastomer engineered to possess these unique properties, and it is not difficult to manufacture. "We are working specifically with bottlebrush polymers, which are prepared by grafting long polymeric side chains to a polymer backbone," explains Sergei Sheiko, professor of chemistry at UNC and corresponding author of the paper. "The resulting molecules may be viewed as filaments that are thick, yet remain quite flexible, which allows for significant reduction of the materials' rigidity and makes them more stretchable. Furthermore, the mechanical properties can be controlled by varying the bottlebrush architecture – for example, by preparing molecules with different degrees of polymerization of grafted chains and different grafting densities. "This architectural control of mechanical properties has reduced the limit of stiffness in dry polymer materials by 1000 times, demonstrated extensibility of up to eight times, and opened up new applications not available to stiffer materials or materials with liquid fractions. One of these applications – their use as free-standing dielectric elastomers – has been demonstrated, which we discuss in this paper."